Originally published under the title "Relatives Of Muslim 'Disneyland Family' Attended Same 'Army of Darkness' Mosque As San Bernardino Terrorists." Mohammad Tariq Mahmood (right), whose family was stopped last week from entering the U.S., was on his way to meet relatives who attend the same mosque as Syed Rizwan Farook and Tashfeen Malik. 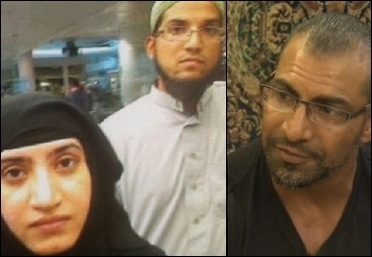 The British Muslim family banned from entering the U.S. this week was on its way to meet relatives in California who prayed at the same mosque as terrorists Syed Rizwan Farook and Tashfeen Malik, who murdered 14 people in San Bernardino this month. On Tuesday, Mohammad Tariq Mahmood, his brother, and nine of their children were pulled from a queue at Gatwick airport by British Border Agency guards and barred from traveling to the U.S. on the instruction of the country's Homeland Security agency. Mahmood has claimed that they were stopped from traveling to California to visit family and Disneyland merely "because they were Muslim." The mosque – linked to the "Army of Darkness" group Tablighi Jamaat [TJ], which itself has historical, indirect links to multiple terrorism cases – became the centre of the investigation surrounding the San Bernardino terrorist attacks, as Breitbart News reported from the scene early in December, revealing an extraordinary refusal of the mosque's elders to co-operate with journalists. Muhammad Mahmood (the relative) is a U.S. citizen who runs an auto repair shop in San Bernardino. He told the BBC that he "did not know him [Syed Farook] personally" and would not have recognised the terrorist and could not recall ever speaking to him. A comment from a Muhammad Mahmood from the same mosque just days after the attack in the Sacramento Bee reads: "It's a sad thing... There will be a backlash, of course... Guess why: I'm a brown-skinned guy with a beard who is named Muhammad." Tablighi Jamaat is a Deobandi revivalist movement whose mandate is, according to its leading advocate Ebrahim Rangooni, to save the Muslim world "from the culture and civilisation of the Jews and the Christians..." To this end, he has suggested cultivating "such hatred for their ways as human beings have to urine and excrement." However, it was reported yesterday how a Facebook account, set up at the London address of the family in the name of Hamza Hussain, has listed job titles such as "supervisor at Taliban and leader at al-Qaeda." Furthermore, on Wednesday it was revealed that Mr. Mahmood's brother, also traveling, had been denied entry into Israel and detained eight years ago on a "lads" trip to Middle East with a "group of older gentlemen." American security agencies have also confirmed the brothers "hit positive for terror checks." A U.S. Customs and Border Protection spokesman said that currently the "religion, faith or spiritual beliefs of an international traveler are not determining factors" when deciding if a person can travel to the U.S. However, the spokesman explained, people can be denied entry for a variety of reasons including health-related issues, prior criminal convictions, security concerns, or miscellaneous grounds. Breitbart London has previously reported on Tablighi Jamaat members performing orchestrated public relations stunts that claim institutional "Islamophobia." In June of this year, a TJ member claimed he had been discriminated against for his Muslim name. In turned out he had hidden his affiliation with the terror-linked Markazi Masjid mosque from his curriculum vitae (resume).